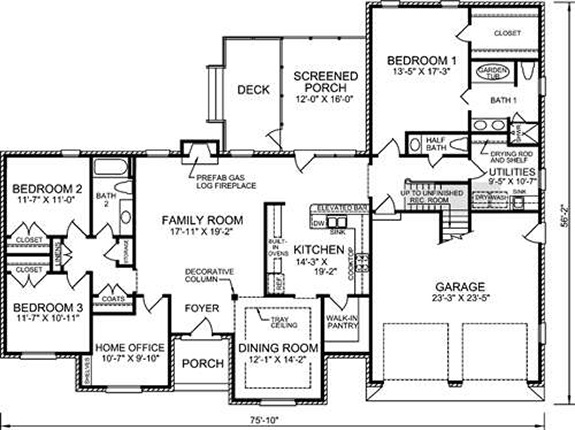 You and your family can live the life of Riley in this distinctive three-bedroom home design. Classic forms and luxurious spaces combine to create a contemporary abode that is just right for the homeowner who demands the best. Elegant sheltered front entry with sidelights and a transom window. Decorative column at the transition from the foyer into the formal dining room with tray ceiling. Nine-foot ceiling throughout. 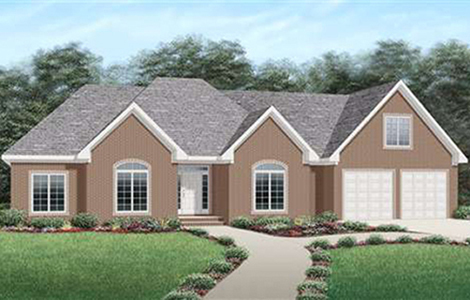 Spacious Family room with a gas log fireplace and nearby French doors to a screened back porch. Elevated bar allows for informal breakfasts and snacks. Built-in ovens, a cooktop, and a walk-in pantry for the kitchen. Master bedroom, located for privacy, has a large walk-in closet and a private full bath with garden tub, separate shower, and double vanity. Bedrooms 2 and 3 have nearby access to a second full bath. Half bath, home office, laundry room with a sink, two-car garage, and unfinished recreation room upstairs complete the special features.